E: We made this salad totally on a whim. 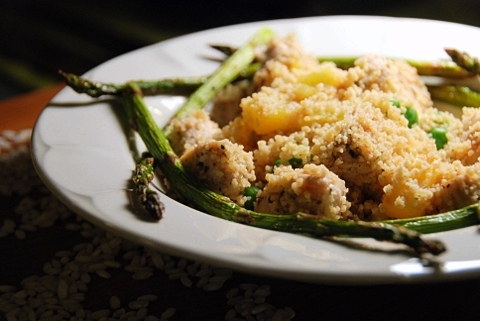 We had some extra pineapple sitting around from an earlier and unpublished recipe, and decided we wanted something with couscous. Joanna loves couscous, but I often find plain couscous is less interesting than even plain pasta. However, warm couscous salads such as this one have no such issues. We loved this! It is one of our favorites and it is a shame it has gone so long unpublished. 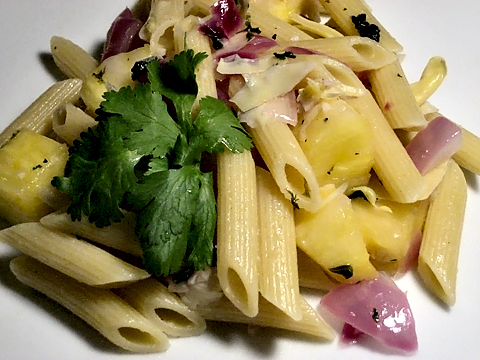 The mix of flavors here is really excellent: if you are a fan of pineapple you will love it, but I think the pineapple blends so well into the dish as a whole that it is worth a try even if you don’t love it on its own. We used some Mediterranean-inspired parsley and basil to flavor the chicken, which we thought played off nicely with the sweetness of the fruit, but the chicken could be done in a multitude of different ways. Toss in some peas and, if you are feeling brave, garnish with some sauteéd asparagus and you have yourself a tasty salad, warm or cold. E: Hi everyone! If you read through this post, you will discover the delicious results of another experiment in things-I-don’t-make-often. I hope you try it, because I thought it was fantastic and so did everyone else who tasted it. Pineapple is one of those things I almost never use. For the longest time I’ve really disliked it, but Iron Chef inspired me to try something just a little bit daring with it. (Spoiler alert: there will be another recipe that uses pineapple going up on the blog in the coming week or two . . . so if you love this sweet, spiny fruit, stick around!) This whole thing was a bit accidental, because I was going to do something with mangoes. But there weren’t any that were ripe enough to eat when I needed them, so I went with a pineapple instead. 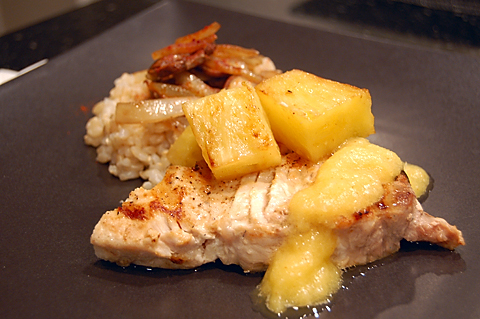 So I did a grilled pineapple swordfish with pineapple-ginger purée, and a smoked paprika, mushroom, and onion sauté with brown rice for a side. You are currently browsing entries tagged with pineapple at Nombudsman.